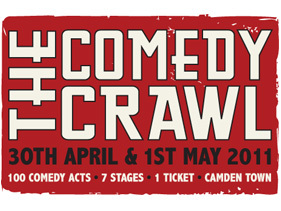 So, as with Prince William on his special day, I spent most of the first part of the the Camden Comedy Crawl covered in tomato juice (word of warning – don’t bite directly into a cherry tomato). Anyway, Laugh Out London soldiered on and managed to enjoy the inaugural urban laughter festival, speaking to some of the performers including Tiernan Douieb, who was holding fort at Belushi’s throughout the day (and drinking a whole weekend’s rider in one night according to Twitter rumour. Also hunted down with our special podcasting nets was the Penny Dreadful’s Humphrey Ker, who was improvising his way throughout the day along with Laura Solon, David Reed and Andy Pugsley. Bec Hill also turned up in our nets after an excellent set upstairs at the Camden Head, where we all learned a little more about soy beans. With intent to bring you all sides of the Crawl though, Laugh Out London doesn’t just feature the gag magi behind the jokes. No, we also spoke to Bex Colwell – a very lovely PR sort in the comedy world who was helping bring the magic to the media. The charming @comedynerd from the Twitter, Carol Fanning, also gave us the comedy fan perspective. A little plug for Carol’s sketch group, Question 17, who will be at Tom Webb’s Party Piece on May 10th at the Queen’s Head in King’s Cross. 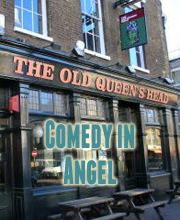 That’s not the same Queen’s Head that Laugh Out London’s comedy night is held on May 6th. The Queen has many heads, like a hydra. We also saw lots of funny people we didn’t speak to including Dan Antopolski, Pippa Evans (as Loretta May), Jay Foreman, Max and Ivan, William Andrews and a whole load more. I mean, loads. It’s a good festival.